Have you felt the earth shake? My apologies – it was the spin cycle on my washing machine. For yes, the felting experiment continues. (c) what temperature and program is best for felting in my washing machine given that I’m in the UK which means it’s a front loading washing machine. Happily there were some sizeable odds and ends left over from the felted bag kit with which to play. Anna suggested the first option to explain the colour change – given that the purple was a single ply yarn was it possible that I had knit one ball with the twist going one way, and the other with the twist in the opposite direction which had given different colour reflections, and that distinct change when the light hit? It’s a good idea and certainly something to remember to check if I ever knit a garment from single plied yarn because the balls, even within the same dye lot aren’t necessarily wound with the twist the same way. 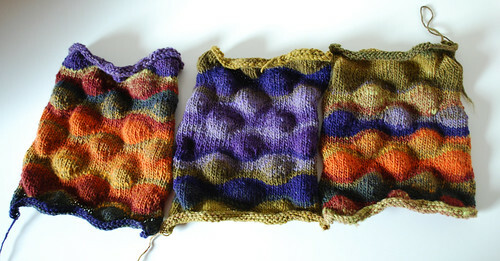 I knit one square from the outside of the remaining ball and another from the inside. And the result? No discernible difference at all. 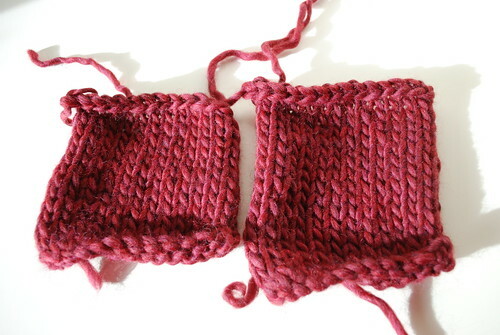 These squares were both knit on 12mm needles which gives a much more open and loose pre-felting fabric; far more like what I was expecting for a pre-felting fabric than the solid bulk of four strands of yarn over 12mm. However, all was not lost – although the real answer was mostly serendipitous. I swatched the Paris with the pale pink Freedom Spirit. And before my eyes, the answer appeared; Paris Mohair Sparkle is variegated. Not sufficiently variegated to be obvious from the outside of the ball in my kit, and when I was knitting with it, the ball was on the floor where I couldn’t see the second colour emerge. The colour repeats are long and it was just coincidence (and a cracking red herring) that the colour shift happened at the start of my second ball. If you look here that’s a Ravelry stash photo of the same yarn in which the two colour variation is much more pronounced. 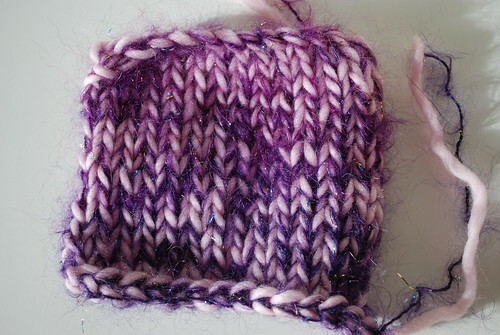 I’m pleased that I’ve found the reason for the colour shift, what I really don’t understand is why Twilley’s put that yarn in the kit when the repeats are too short to do stripy or subtly variegated (both of which would be cool) – it’s a mystery! Stage 2 involved far more technical analysis: 1 washing machine, 3 swatches. The first load of laundry that I needed to do was a 40 degree ‘Acrylics’ wash – slightly longer program than my 60 degree fast wash, but obviously a lower temperature and I was starting with what I considered to be a more reasonable pre-wash gauge. The result is a more flexible finished felt, although still with sufficient thickness that H asked whether I was planning on knitting 21st century chain mail. Actually H’s latest theory is that a dart would bounce off it – maybe I should put that one to the test? It has certainly shrunk considerably compared to the ‘control’ swatch. Most of the stitch definition is gone and as you can see from the little loose strand, the yarn has gone from a very smooth soft singles yarn to being distinctly nubbly – the felt definitely has texture and I think it could make a good bag fabric, possibly when knit at a looser gauge originally. 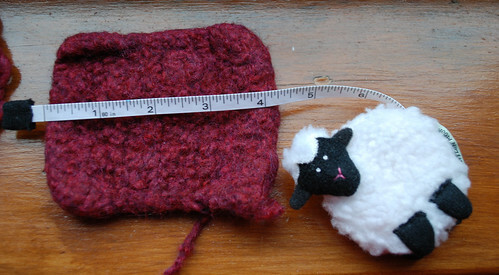 No felting at all on either – if anything the red swatch grew a bit. All hail the power of my wool wash cycle! So I still have two unfelted samples so I think I’m going to try the 40 degree wash again with very restricted spinning and possibly the 30 degree wash on my usual spin setting and as H has a sports match this weekend there’ll be no shortage of laundry! I have been very lucky in my life to live in some very beautiful places and none more so than the area of Devon that I grew up in. It is a designated Area of Outstanding Natural Beauty (and indeed it is), a technical term that is supposed to prevent crazy planning applications and any sort of development that takes away from said Natural Beauty. I’ve got used to seeing pictures of places that I know intimately on postcards in motorway service stations, on the front of packets of fudge, and frequently appearing in west country dramas. If you’ve ever watched some of the more recent (and some older) Poirot adaptations, they are all filmed around Salcombe, Dartmouth and Burgh Island; and my highlight to date was recognising the path to the lighthouse from a panning shot at the start of a Mrs Bradley Mystery before the lighthouse even came into view. That arrow (badly drawn in by me) points at the pine tree above my parents’ house. I have swum from that beach more times than I could remember, and a walk down the hill, along the beach and back again is the standard constitutional when at home. I couldn’t tell you which pixels are their chimney but I’m still pointing and giggling that my childhood home is on the cheese. 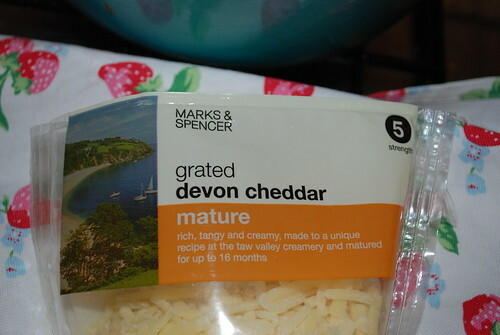 I should also point out that my parents live in South Devon and the cheese (according to the label) comes from the Taw Valley. In North Devon. 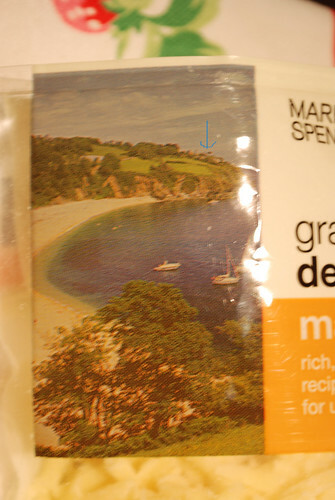 Despite this clear attempt at misrepresentation by Marks & Spencer it was still very nice cheesy mash. I may be a little excited by this. Sorry. I’ll try not to shout so much. 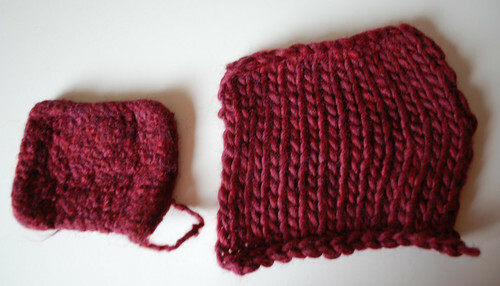 As I said, the knitting itself is very simple, the beauty is the soft gradual blur from one colour to the next. 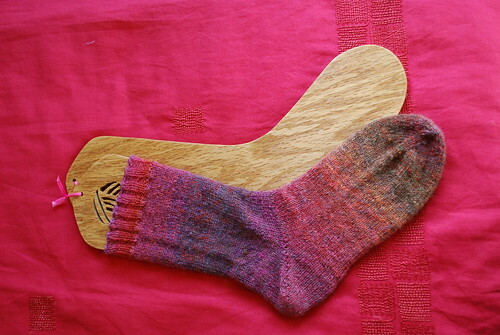 I used half-ish of the barberpole three ply for the sock and then used the chained 3ply for the ribbing. It is soft and wonderful to wear and I’m scuttling off to knit a few more stitches on a secretsecretsecret so that I can cast on the next one! Lost: One Knitter. Last seen in the vicinity of an enormous star quilt and her sewing machine. As I stood at the foot of this cascade of cotton I heard a muffled “but how do they manage it? how do they do all that quilting on so much fabric? !” but when I leaned closer I heard only the softly hacking rattle of a bobbin turning in its casing as the outline of stars appeared from underneath the walking foot. And now, back to the studio! These three may be in the running for my most favourite squares of all – my favourite kind of burnt orange, velvety purple, olive green and a splash of lime – what’s not to like? 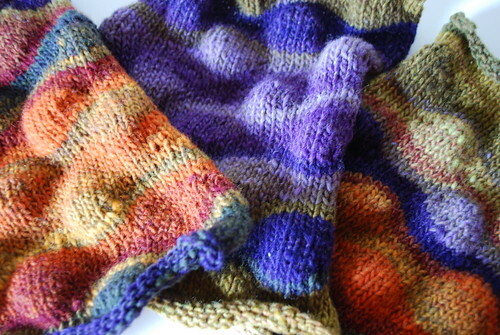 What is perhaps not at first apparent is that these are all the same colour – Noro 185 – a colourway so wonderful that we bought it twice; at least, we bought two balls, the only time we did a ‘repeat’ when shopping Stateside. The great tragedy of this colour is that Noro don’t supply it to the UK. How could they deprive us so unfairly – it’s probably the first Kureyon that I’ve seriously considered knitting a garment from as opposed to hats, scarves and blankets. I’m going to have to start petitioning Noro- it’s really the only way. 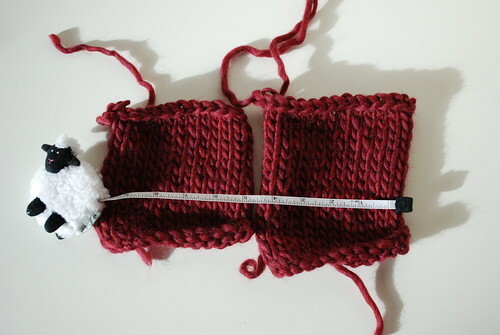 Given that I seem to have been naming my squares as I go along, I spent some time watching the yarn and waiting for the associations to jump out at me and as I did that I couldn’t shake the feeling that it was something to do with wine. Sure, there was a deep purple, and a claret red, but where did the orange fit in, and the lime splash wasn’t really leaf green. And then it struck me. I’ve been stalking Holiday Yarns’ website (formerly Vancalcar Estates – purveyors of the Tsock Tsarina’s routes to madness, sorry I mean sock kits) waiting for the right moment in the family fortunes to place a little order (and watching the pound crash against the dollar in the meantime) and the colours of the Noro are the colours of one of the socks that my mouse hovers over every time. The name of these three squares …. is Vintage. Since I started quilting I’ve been on two brilliant quilting courses, both run at Quilter’s Den in Warwick. The first, last February, was beginner log cabin. 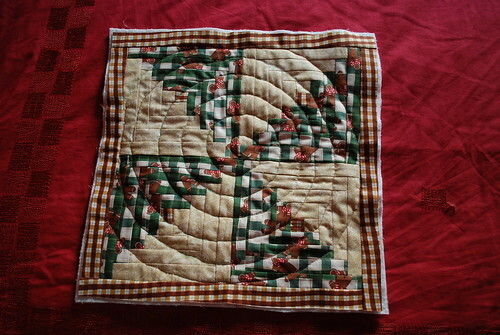 I made by log cabin squares, joined them together in a whirligig pattern, added a border… and popped it in the cupboard. 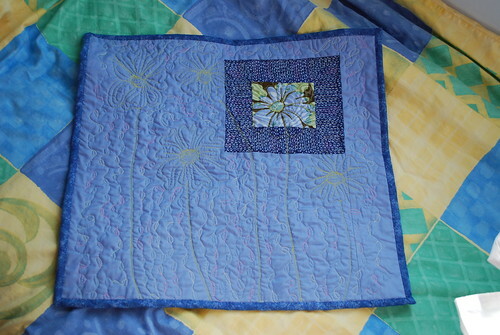 In October I went on the Take One Flower course to learn free motion machine quilting and after a few battles with my sewing machine I put together the mini quilt top and free motion quilted flowers and wavy leaves all over it … and popped it in the cupboard. Now that I’ve finished my big Star Quilt I thought it might be time to try out a bit more quilting, and learn how to bind a quilt on the mini quilts before I tackled the starry behemoth. 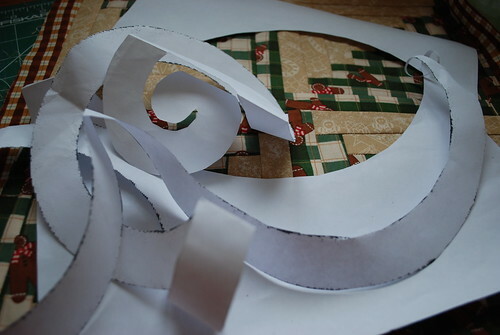 But once unwrangled gives a great spiral stencil. 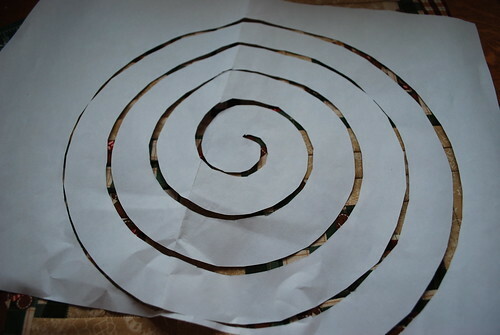 I matched the centre of the spiral to the centre of the quilt block and drew round the lines in a washable marker. If you look carefully you can see the turquoise lines. When the stencil ran out I simply carried on freehand using the same spacing to give one continuous swirl. 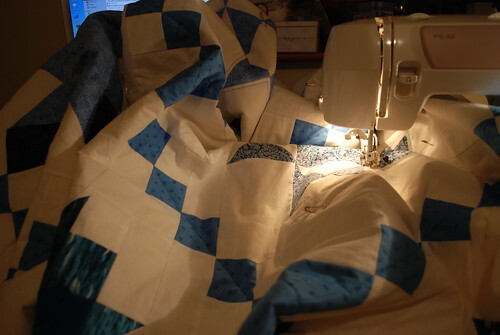 And then came the moment of truth – the quilting! 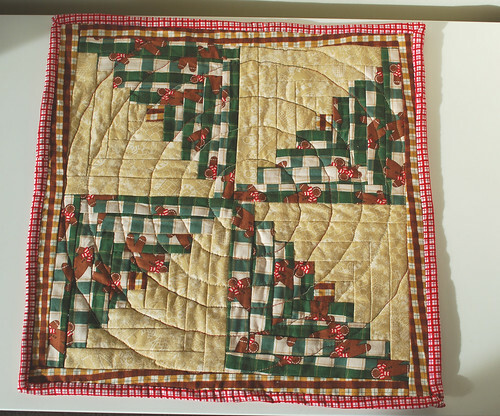 My freemotion quilting is still very basic beginner level and what I learnt most from this is that it is really hard to quilt a smooth continuous line – wiggly leaves are so much easier. 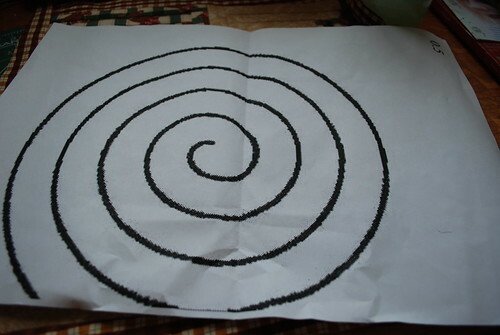 It definitely looks like a spiral though – just don’t look too closely! 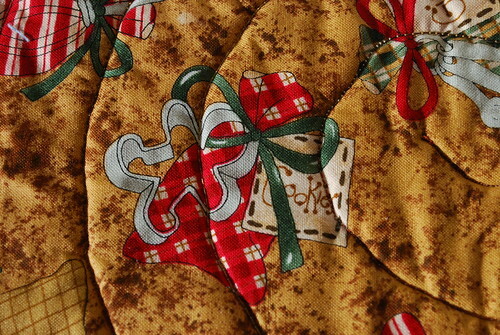 I used a variegated brown-cream machine quilting thread which is why some of the quilting looks darker than other bits. 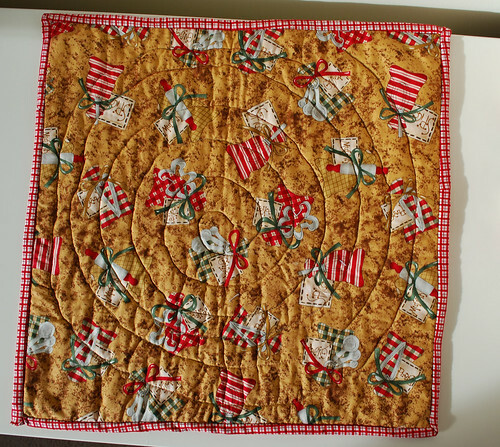 The machine quilting thread is a bit thicker than ordinary thread and you have no idea how long it took to get the bobbin to set correctly – I think it doesn’t like machine quilting thread all that much but it’s worth it in the end. For Stage 2, applying the binding, I followed Amanda Jean’s excellent tutorial (which can be found here) – it has lots of close up photos and there wasn’t anything that I didn’t understand in her instructions. 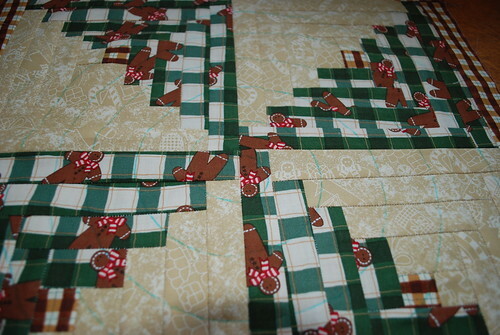 And it goes really well with the backing fabric. Maybe I should make some little gingerbread people to go with it? 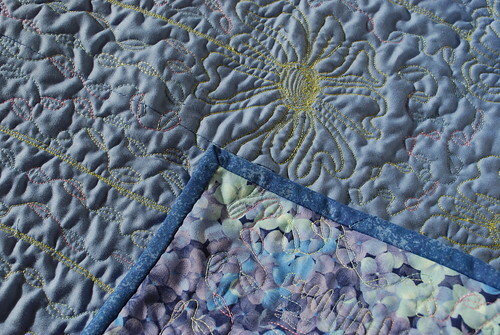 The Periwinkle-Daisy mini quilt was much quicker to finish because it had already been quilted, and because I had more of an idea about what I was doing! The binding is a gently variegated blue that adds a border without taking anything away from the flowers and looks quite nice next to the Hydrangeas on the back. The binding isn’t perfect on either quilt and I’m sure to a trained eye they look wonky and bumpy and have wibbly sides but for a first attempt I’m pretty pleased with them. 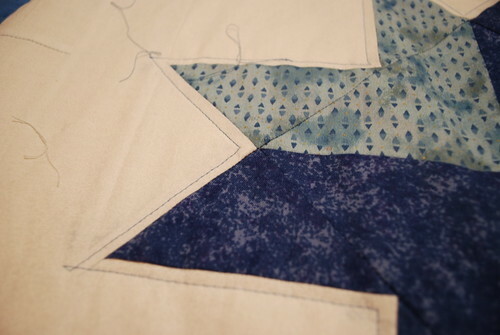 As I sat on the sofa handstitching the bindings to the front of the quilt I showed each one to H and he responded that he thought they were very nice little quilty things – whatever they were meant to be. Truth be told, these aren’t meant to be anything other than practice pieces – so I think I’m going to put them on the wall in my sewing room for inspiration and insulation. Because clearly a room that has half a wall of yarn cupboards is in great need of insulating!